CBS announced today that the digital edition of Big Brother will premiere just ONE week after the Big Brother 18 finale, on Wednesday, September 28th. The edition will be titled "Big Brother: Over The Top" and we got all the details....well kinda. 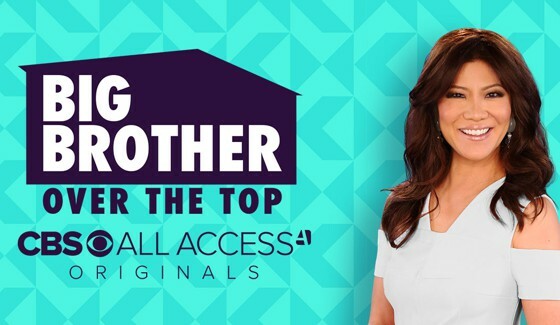 First off, we already know from CBS confirmation of the show a month ago that Big Brother Over The Top will air exclusively through CBS All Access. That means you MUST have a subscription to CBS All Access in order to watch BB OTT. The subscription will only cost you $5.99/month or $9.99/month if you want to upgrade to the commercial-free option. Already have an All Access subscription? Don't worry, just don't cancel your current subscription and you'll be good to go. CBS.com -- "BIG BROTHER: OVER THE TOP will welcome an all-new cast of Houseguests to the BIG BROTHER House in a 10-week season that reimagines the BIG BROTHER format for multi-platform audiences. Fans will have more opportunities to engage with the Houseguests, while also having access to all the BIG BROTHER interactive features they love – 24/7 live feeds, chat and impact votes, plus a weekly one-hour episode with live evictions and more. Additional details for BIG BROTHER: OVER THE TOP will be announced at a later date." To recap; 10 Weeks of Big Brother, weekly live eviction episodes (much like what we have now), some sort of weekly episodes, no competition blackouts - 100% LIVE, and more influence over the game. In addition, we've learned the grand prize is only $250,000 not $500,000 like the broadcasted version. Will you be watching Big Brother Over The Top? Let us know your thoughts in the comments!